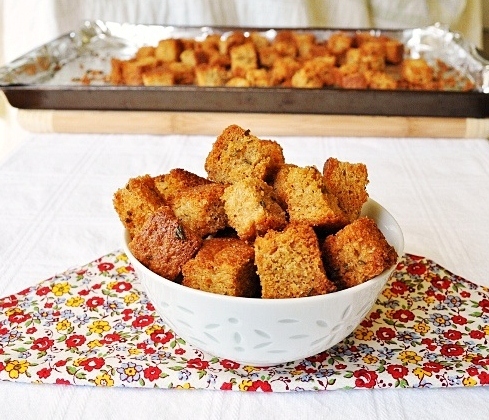 Making homemade croutons is so simple - there really shouldn’t be any excuse as to why I don’t make them all the time instead of buying them. I don’t know why, but it seems that every time I make them we all end up snacking on them. This batch pictured here was eaten in less than 4 hours…..and we didn’t even have salad or soup! 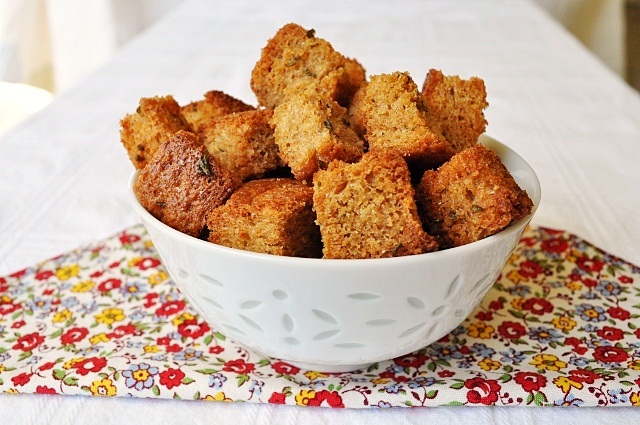 I love that croutons can have so many variations – cheesy ones, garlic & herb, etc. It’s fun to switch it up and try different things. When I worked in the kitchen at my son’s school we made croutons all the time with the leftover bread and/or rolls. It was always important to us to not waste anything and to cook as much as we could from scratch. Everyone that ate at our salad bar loved the homemade croutons and were disappointed on the days we didn’t have them. This recipe is a basic one that I use at home. Feel free to add or omit according to your taste/preferences. Preheat oven to 375, and line a cookie sheet with aluminum foil and spray with cooking spray. Place the cubed bread in a large bowl and drizzle it with the olive oil. Toss until all the bread is evenly coated with the olive oil. Next add all of the remaining ingredients and toss again to make sure all the bread is evenly coated. Pour the bread onto the cookie sheet and bake for 20-30 minutes, or until the croutons are browned and have reached your desired crunchiness. I'd like to share this recipe (with proper attribution given to you of course) in our local newspaper in a weekly food column I write. Would you allow me to do this? I would greatly appreciate it. I made these, and they are SO amazingly easy, I want to tell everyone else about them.